Mohenjo-daro (Urdu: موئن جودڑو, Sindhi: موئن جو دڙو, English: Mound of the dead)—a city of the Indus Valley Civilization built around 2600 B.C.E., located in the Sindh Province of Pakistan. That ancient 5,000–year–old city constitutes the largest of Indus Valley, widely recognized as one of the most important early cities of South Asia and the Indus Valley Civilization. Mohenjo Daro, one of the world’s first cities and contemporaneous with ancient Egyptian and Mesopotamian civilizations, has been sometimes referred to as "An Ancient Indus Valley Metropolis." The discovery of Mohenjo-daro led to tremendous excitement in the archeological and historical worlds. Although the beginning of the Indus Valley Civilization predated the founding of Mohenjo-daro, and thousands of villages and towns had been discovered throughout the region occupied by the Indus Valley people, Mohenjo-daro represented the largest, most sophisticated city discovered. As work with the archeological dig progressed, archaeologists believed that they had discovered the key city in the civilization, existing during the flowering of the Indus Valley Civilization from 2600 B.C.E. to 1700 B.C.E. Keys to the foundation of the world's religions that appeared in the region, including Hinduism, Jainism, and Buddhism, as well as the nations and empires that appeared later, lay within the unearthed city. Mohenjo Daro, built around 2600, had been abandoned around 1700 B.C.E.. Sir John Marshall's archaeologists rediscovered it in the 1920s. His car, still in the Mohenjo-daro museum, shows his presence, struggle, and dedication for Mohenjo-daro. Ahmad Hasan Dani and Mortimer Wheeler carried out further excavations in 1945. 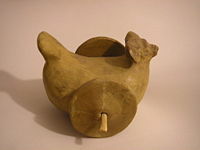 Mohenjo-daro in ancient times had been most likely the administrative center of the ancient Indus Valley Civilization. 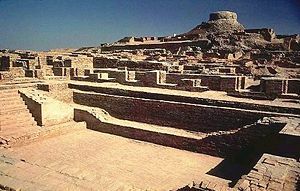 The most developed and advanced city in South Asia during its peak, Mohenjo-daro's planning and engineering showed the importance of the city to the people of the Indus valley. The Indus Valley Civilization (c. 3300–1700 B.C.E., flowered 2600–1900 B.C.E. ), abbreviated IVC, had been an ancient riverine civilization that flourished in the Indus river valley in Pakistan and north-west India. "Harappan Civilization" had been another name for this civilization. The Indus Valley civilization had been one of the most ancient civilizations, on the banks of Indus River. The Indus culture blossomed over the centuries and gave rise to the Indus Valley Civilization around 3000 B.C.E. The civilization spanned much of Pakistan, but suddenly went into decline around 1800 B.C.E. Indus Civilization settlements spread as far south as the Arabian Sea coast of India, as far west as the Iranian border, and as far north as the Himalayas. 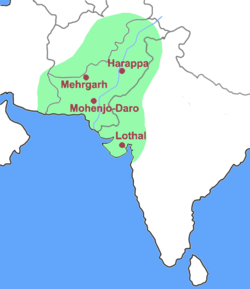 Harappa and Mohenjo-daro, as well as Lothal numbered among the settlements the major urban centers. Mohenjo-Daro, 25 km southwest of Larkana, had been the center of the Indus Valley Civilization 2600 B.C.E.-1700 B.C.E. Mohenjo-daro had been a remarkable construction, considering its antiquity. It has a planned layout based on a grid of streets, laid out in perfect patterns. At its height the city probably had around 35,000 residents. The buildings of the city, of particularly advanced designed, had structures constructed of same-sized sun dried bricks of baked mud and burned wood. The public buildings of those cities also suggest a high degree of social organization. The great granary at Mohenjo-daro, designed with bays, received carts delivering crops from the countryside. Ducts exist for air to circulate beneath the stored grain to dry it. Close to the granary, a building similarly civic in nature stands: a great public bath, with steps down to a brick-lined pool in a colonnaded courtyard. The elaborate bath area had been extremely well built, with a layer of natural tar to keep it from leaking, and in the center stood the pool. Measuring 12m x 7m, with a depth of 2.4m, the pool had been likely used for religious or spiritual ceremonies. The houses had been designed and constructed to protect inhabitants from noise, odors, and thieves. That urban plan included the world's first urban sanitation systems. Within the city, individual homes or groups of homes obtained water from wells. Some of the houses included rooms that appear to have been set aside for bathing, waste water diverted to covered drains, which lined the major streets. Houses opened only to inner courtyards and smaller lanes. A variety of buildings stood up to two stories high. Being an agricultural city, it featured a large well, and central marketplace. It had a building with an underground furnace (hypocaust), possibly for heated bathing. Defensively, Mohenjo-daro constituted a well fortified city. Lacking city walls, it did have towers to the west of the main settlement, and defensive fortifications to the south. Considering those fortifications and the structure of other major Indus valley cities like Harappa, lead to the question of whether Mohenjo-daro served as an administrative center. Both Harappa and Mohenjo-daro share relatively the same architectural layout, generally lightly fortified like other Indus Valley sites. Obviously, considering the identical city layouts of all Indus sites, they served in some kind of political or administrative capacity, although the extent and functioning of an administrative center remains unclear. .
Mohenjo-daro had been successively destroyed and rebuilt at least seven times. Each time, the new cities built directly on top of the old ones. Flooding by the Indus may have been the cause of destruction. The city divided into two parts, the Citadel and the Lower City. Most of the Lower City remains uncovered, but that the Citadel had the public bath, a large residential structure designed to house 5,000 citizens and two large assembly halls, has been determined. Mohenjo-daro, Harappa and their civilization, vanished without trace from history until discovered in the 1920s. Although extensively excavated in the 1920s, in-depth excavations suspended in the 1960s. "There is her little Baluchi-style face with pouting lips and insolent look in the eye. She's about fifteen years old I should think, not more, but she stands there with bangles all the way up her arm and nothing else on. A girl perfectly, for the moment, perfectly confident of herself and the world. There's nothing like her, I think, in the world." 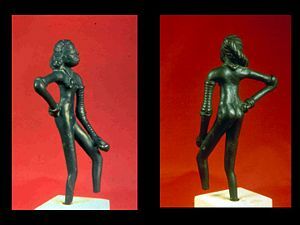 John Marshall, one of the excavators at Mohenjo-Daro, described her as a vivid impression of the young ... girl, her hand on her hip in a half-impudent posture, and legs slightly forward as she beats time to the music with her legs and feet. The artistry of that statuette has remained recognizable today, telling of a strange, but at least fleetingly recognizable past. As author Gregory Possehl says, "We may not be certain that she was a dancer, but she was good at what she did and she knew it." The statue could well be of some queen or other important woman of the Indus Valley Civilization judging from the authority the figure commands. Seated male sculpture, or "Priest King" (even though no evidence exists that either priests or kings ruled the city). That 17.5 cm tall statue represents another artifact which has become a symbol for the Indus valley civilization. Archaeologists discovered the sculpture in Lower town at Mohenjo-Daro in 1927, found in an unusual house with ornamental brickwork and a wall niche, lying between brick foundation walls which once held up a floor. This bearded sculpture wears a fillet around the head, an armband, and a cloak decorated with trefoil patterns that were originally filled with red pigment. The two ends of the fillet, falling along the back and though the hair, has been carefully combed towards the back of the head, without a bun. The flat back of the head may have held a separately carved bun, like the other traditional seated figures, or it could have held a more elaborate horn and plumed headdress. Two holes beneath the highly stylized ears suggest that a necklace or other head ornament had been attached to the sculpture. The left shoulder, covered with a cloak decorated with trefoil, has double circle and single circle designs originally filled with red pigment. Drill holes in the center of each circle indicate they had been made with a specialized drill and then touched up with a chisel. Eyes, deeply incised, may have held inlay. The shaved upper lip and a short combed beard frames the face. The large crack in the face resulted from weathering or may have happened in the original firing of that object. UNESCO designated Mohenjo-daro a World Heritage Site. The most extensive recent work at the site has focused on attempts at conservation of the standing structures, undertaken by UNESCO in collaboration with the Department of Archaeology and Museums, as well as various foreign consultants. In December 1996, preservation work at the 500-acre site suspended after funding from the government and international organisations ran out, according to a resident archaeologist. In April 1997, the UN Educational, Scientific and Culture Organization (UNESCO) funded $10 million to a project to be conducted over two decades to protect the Mohenjo-daro ruins from flooding. That project has been a success so far. UNESCO's efforts to save Mohenjo-daro has been one of the key events that led the organization to establish World Heritage Sites. Dales, George F., Jonathan M. Kenoyer, and Leslie Alcock. Excavations at Mohenjo Daro, Pakistan The Pottery. University Museum monograph, 53. Philadelphia: University Museum, University of Pennsylvania, 1986. ISBN 9780934718523. Lahiri, Nayanjot. Finding Forgotten Cities How the Indus Civilization Was Discovered. London: Seagull, 2006. ISBN 9781905422180. Marshall, John Hubert. Mohenjo-Daro and the Indus Civilization Being an Official Account of Archæological Excavations at Mohenjo-Daro Carried Out by the Government of India between the Years 1922 and 1927. London: A. Probsthain, 1931. OCLC 5298990. Westwood, Jennifer. The Atlas of Mysterious Places The World's Unexplained Sacred Sites, Symbolic Landscapes, Ancient Cities, and Lost Lands. New York: Weidenfeld & Nicolson, 1987. ISBN 9781555841300. This page was last modified on 13 October 2018, at 16:14.